A bird’s eye view of the farm may be the best way to spot a profit in today’s ag economy. That perspective is available with remote imagery—a source of information that has lingered overhead for decades that is now coming of age. Getting a lift. Advancements in cameras, sensors, and computer software tools are the technologies that are making imagery more useful, but it’s the popularity of unmanned aerial vehicles (drones) that has brought it to farmers’ attention. 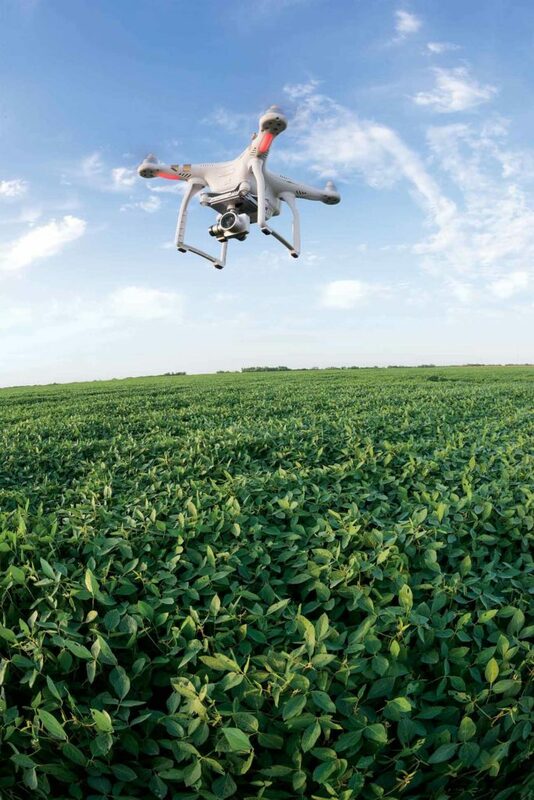 Manned aircraft and satellites are also platforms for imagery, but the Institute of Electrical & Electronics Engineers estimates that farmers purchased 45,000 drones in 2016—a number sure to soar now that federal regulations for their commercial use have been streamlined. Preston, Maryland, farmer Dave Schmidt became intrigued with the opportunities he saw by flying a drone costing roughly $1,500 over his family’s 800-acre farm. “We immediately spotted several problems, including uneven fertilizer application from a new 120-foot sprayer and developing stress in our soybeans. Either of these was enough to pay for the drone in a short time,” he says. Last winter, Schmidt passed the FAA’s Part 107 exam to obtain his Remote Pilot Certificate so he can legally act to correct what his flights reveal. He’s also launched KNK Drone Services to do the same for his neighbors. “I’m confident this technology will make farmers more productive and efficient. It’s not a miracle tool, but it’s certainly a good one,” he says. The standard color camera on Schmidt’s quad-copter gathers RGB (Red/Green/Blue) data in the visible light spectrum. He uses Drone Deploy—a flight planning and mapping software tool—to stitch images from overlapping passes of the drone into a map that’s analyzed by the software to highlight variations in crop health—a process called false NDVI. “We use the map to guide us to areas of concern in the field to diagnose the problem. It’s an entry-level approach that is inexpensive, but we’re learning a lot,” adds Schmidt. Dave Brauer (right) and Wayne Milton study SLANTRANGE imagery that shows individual plants—and weeds—in a corn field. Learning more. To learn even more from imagery, users can step up to a multispectral camera or sensor capable of gathering not only RGB data but also one or more bands of near infrared (NIR) light that is reflected off the crop canopy. NIR light is in wavelengths unseen by the human eye, but plants reacting to stress reflect it much earlier, and more drastically, than light in the visible wavelengths. Analysis software combines NIR readings with those in the red band to calculate a Normalized Difference Vegetation Index (NDVI). True NDVI is a more accurate depiction of early stages of stress from drought, disease, insect infestation, nutrient deficiency or a host of other crop health threats. 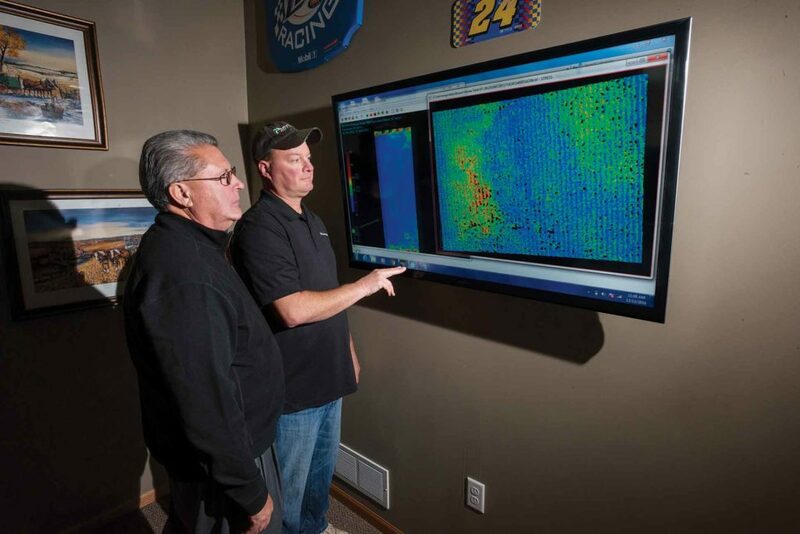 “Multi-spectral cameras can cost $3,000 to $5,000 and can provide information to develop variable-rate application maps, which is probably the best use of imagery,” says John Nowatzki, ag machine specialist at North Dakota State University. Drones have the advantage of delivering resolution down to a few inches, and that’s important to Friend, Nebraska, farmer Dave Brauer. “We’re able to check plant populations shortly after emergence and that helps us determine sidedress nitrogen rates. And, we can spot individual weeds and map their density for targeted herbicide applications,” says Brauer. Through Nebraska Agricultural Data & Drones, Bauer provides drone-scouting services at a cost of roughly $3 per acre or a seasonal package of five flights for $12. The company also sells systems that include a drone, multispectral camera, software and a patented sensor to compensate for variable lighting for roughly $14,000. More technology. In North Dakota, Nowatzki has compared ten cameras on seven different fixed-wing and multi-rotor drones. In addition to RGB and multispectral cameras, he’s tested more advanced hyperspectral cameras—capable of gathering hundreds of wavelengths (see diagram above) and thermal cameras that sense heat variations as small as .005 degrees F.
Thermal cameras range in cost from $1,000 to $10,000 and a hyperspectral unit goes for $40,000. Nowatzki has found that at this level of technology imagery can diagnose specific crop diseases and weed species as well as if the weeds are herbicide resistant. “The advanced cameras are probably best used in a fixed-wing drone or manned aircraft that can cover more acres than a multi-rotor,” he says. A love of flying got Lowell, Indiana farmer Brian Sutton involved in imagery. “It’s easy to pick out patterns in the field from the airplane, so we started taking pictures to determine the cause. This lead to using a multispectral camera to collect NIR data and make ADVI maps—an advanced version of NDVI maps. These highlighted patterns of stress in the field, but when we started using a thermal camera we felt we were learning even more—it saw things the other cameras could not,” says Sutton. Drones are a quick way to view a field, but capacity is limited by line-of-sight regulations. Four years ago, Sutton started Air Scout, an imagery service provider that contracts with 20 pilots across the country to fly farms from ten to fourteen times per season. The service delivers true color, NDVI and thermal imagery within 24 hours of each flight at an annual cost of $8 to $10 per acre. Satellite view. Satellites may be based in space, but thanks to software apps from Satshot and Farmshots, imagery can be delivered directly to tractor cabs through John Deere’s Operations Center-—apps from Sentera, Honeycomb and Precision Hawk do the same for drone imagery. At an annual cost of only $.50 to $.75 per acre, satellites are the cheapest source of imagery and are usually the fastest way to get an overall view of the farm. Limitations from low resolution and infrequent coverage are being quickly countered by more satellites carrying improved cameras. “Satellite imagery isn’t only the 30-meter resolution and 16-day interval product that’s come from the Landsat system since 1997,” says Faleide. “We still use Landsat, but there are many other satellites to chose from and we can get 3 to 5-day frequency and 5 to 10-meter resolution (or better) to produce variable-rate maps more detailed than most equipment can accommodate,” he explains. Satellite imagery is getting a boost from a project already underway by Planet Labs. “We’re launching the largest constellation of satellites ever put in space,” says Lee Smith, Planet’s director of North American sales. Planet’s system will consist of 150 small ‘Dove’ satellites—each weighing about ten pounds—that will photograph every foot of the earth’s surface daily at 3 to 5-meter accuracy. “On a typical day 60% of the earth’s surface is covered by clouds so daily images are a plus,” says Smith. “Ultimately, satellites and drones will likely work together on farms,” adds Kansas State University’s Ignacio Ciampitti “A satellite image with 5-meter resolution can provide early warning of developing crop problems and then a drone- with much higher resolution can be used to investigate and diagnose the cause,” he says. The urban chicken movement provides farmers with a new income stream.